Fitbit has led its way in the fitness tracker and smart pebble industry, placing the brand as world highly considerable one. However, when the company tries to expand its product range in smartwatch market with Fitbit Ionic, we think this fitness tracker manufacturer still needs to learn a lot from competes. Take a look at Blaze, the company’s first ever smartwatch, which was not that stunning in smartwatch category. But, in fitness tracker category, Blaze wins a lot. And in the second release, the company went with Surge, which seems like to struggle so much to get consumers turn their head off from other competes such as Apple Watch, Samsung Gear, or even the affordable Huawei Watch. So, in the next release, Fitbit tried to get its luck again with the one called Fitbit Ionic, which is basically a combination of two previous devices, Blaze and Surge, turning into one squarely sleek smartwatch product. However, experts think Fitbit’s decision to release Ionic to mark its tenth anniversary is such a rush. Indeed, the company has succeeded in creating a device with great display, longer battery life, and comfy lightweight materials. But at some points, there are many things that this smartwatch still needs to improve, especially when nowadays smartwatch market competition is getting tightened. So, how we see the new Fitbit Ionic from our perspective? Here is the review. Fitbit Ionic’s design with its geometrically square display is gorgeous. It really stands out, especially when it’s also combined with bright LED screen. 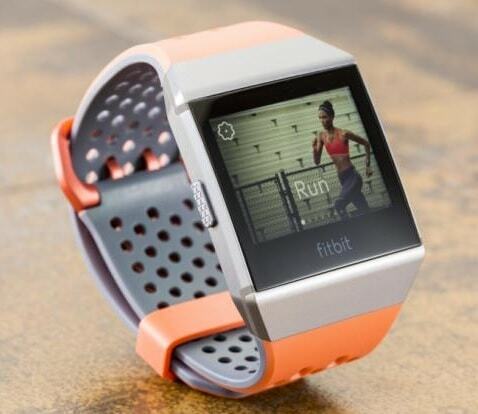 It strong squarish edges really represent what Fitness tracker needs to appear; rugged. But, if we could choose, we prefer to pick circular design just like on Huawei Watch 2 and Samsung Gear S3, or rather square face with softer edges like the iconic Apple Watch, because when it comes to dressing up, the too-strong squarish profile on Ionic is a bit difficult to get matched. However, using Ionic is incredibly comfortable. The watch is super light, and the rubbery band felt just right attached on our wrist. Even wearing it when we’re sleeping at night, the tapered sides of Fitbit Ionic and its unique angles will not result a significant sore on the wrist. As for the band, Fitbit includes small and large textured-rubber band in the package. But, for you who want to personalize the band, other options are available in 50 Pounds for the leather band, and 25 Pounds for the rubbery sport one. Moving to the watch face, there are 3 different colors offered; silver, metallic grey, and orange. On top of it, it’s crowned by 1.42 inch OLED display with 348 x 250 pixels resolution. As mentioned before, this display is gorgeous. It’s crisp, bright, and the color is punchy, reaching 1000 nits of peak. As a comparison, this is the display that’s as bright as HDR TV, or simply, it’s similar with two-first edition of Apple Watch. With this bright screen, it won’t be that difficult to read even under direct sunlight. Moreover, you don’t need to worry the screen will get scratch when using Fitbit Ionic since it’s already coated with Gorilla Glass 3. And not to mention, this smartwatch is also water resistance up to 50 meters of dept, which is quite impressive compared to other products in the markets. Surely, this water resistance capability is to support Ionic function in doing under-water tracking as the device also provides swim tracking function. Getting to the watch side, we can find three functional buttons. The left one is to activate and deactivate the screen as well as functions as back button. Then the two other buttons are for context-sensitive function. While on the rear side of Fitbit Ionic, there are heart rate sensor and a proprietary charging adapter. We can’t say much about features on Fitbit Ionic, especially when it’s compared to other mainstream smartwatch product such as Huawei’s, LG’s, Samsung’s, or even Apple’s. However, it’s understandable since for a long time, Fitbit has concerned on their fitness tracking device. So, it’s no surprise if the company added a little more emphasize on tracking function on Ionic, rather than completing it with common smart watch features. As an advance fitness tracking device, the Fitbit Ionic is completed with a bunch of sensors. These are gyroscope, three-axis accelerometer, and altimeter for tracking how many stairs you’ve taken. Moreover, as mentioned before, heart rate monitor sensor is also available. It keeps tracking your heart rate during the day when you are walking, running, biking, and during the night when you are sleeping. In addition, there is also GLONASS/GPS, which works pretty accurate with satellite positioning radios technology. It will provide you some important information such as the route you’ve taken on map, speed, and distance travelled. And more interestingly, the Ionic’s pause mode will make the watch stops tracking when you take a rest, and will start tracking again as you start moving. All the will be presented in easy-to-understand manner in Fitbit App. Storage sector is quite pleasing too with 2.5 GB capacity. This storage is essentially aimed for storing music. By using Fitbit Ionic, you can even stream your music through third-party application. But so far, this tracker only supports Pandora music. It’s a big hope that Fitbit will update this device to support other music streaming applications soon in the future. While for connectivity, Bluetooth and NFC are available. Specifically for NFC, it can be used for contactless payment, which in such manner, is similar to Apple Pay. For tracking function, Fitbit Ionic is really something we can depend on. But for Smartwatch, we do not totally agree with that, especially with the several basic issues on Ionic that actually, are the issues that smartwatch should really avoid. First, it’s about un-smooth animations. It felt so annoying, especially when we do scrolling on the menu. Second, transferring data between the watch to the smartphone takes ages, it’s longer even when compared to the average level of smartwatch. Apparently, Fitbit still needs to work on fixing Bluetooth connectivity on the Ionic. Then, the third-party application, which is essential for smartwatch, is still very limited. Not stopping on that, the OS is also felt to slowing down occasionally, and the User Interface is not that eye-catching. Furthermore, the Ionic notification system is also not something we can admire. Not only that it’s just a passive notification, you can’t also do a lot when this notification coming in. Indeed, it can expand, but reading the whole message or emails is impossible. So you may need to check your phone instead. On the other hand, Fitbit Ionic is also praised for its long battery life, and full package tracking system. Besides, its display is another impressive thing. It has pleasing screen and ultra comfortable band. Moreover, it’s also lightweight and water-proof up to 50 meters depth. Last but not least, the Fitbit NFC contactless payment method is another thing to look at, especially when you need emergency purchase during your run. Talking about price, Fitbit set a very high value for Ionic. 300 Pounds is the value you need to spend when you’re about to afford it. Yes, it’s 300 Pounds! It means that it’s just slightly lower than Apple Watch Series 3, which is offered in 329 Pounds for non 4G edition, or Samsung Gear S3 Frontier which is offered in 349 Pounds. This price is also topping the nicer choice Huawei Watch 2, which is offered in around 210 Pounds. However, if you think that this is the worth price for buying Fitbit’s big name, then Fitbit Ionic must be a good choice.